I try to get a longish walk at least once each week. Today I walked the towpath from Swanley to Wrenbury foraging for food along the way. Jan rejected the mushrooms I’d found because she wasn’t convinced they were actually edible mushrooms. One assumes if they had been “magic mushrooms” we could have taken a “trip” without leaving the mooring . My second piece of foraging was more successful and I returned with a litre of strawberry ice cream from the small convenience store in Wrenbury. 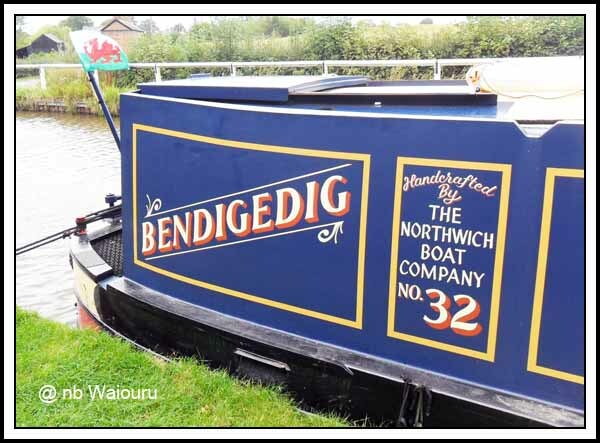 Whilst walking through Wrenbury I passed nb Bendidedig. No obvious sign of Eric & Elsie although I had a glimpse of a hairy arm washing dishes through one window. I thought it might be imprudent to get between a man and his work so left the meeting for another day. There are two pubs at the canal end of Wrenbury. 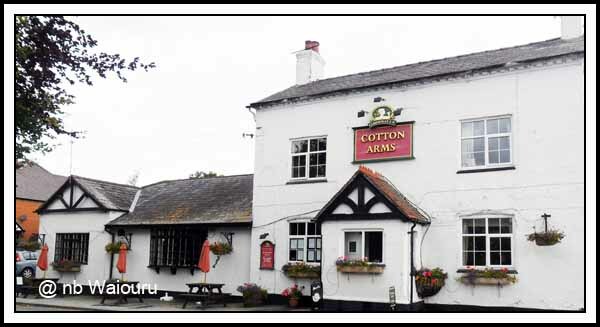 We had dinner with Peter & Margaret at the Cotton Arms the day we moved onto Kelly-Louise. The other pub is “Dusty Miller” and there were delicious smells from the kitchen wafting on the breeze. My stomach reminded me it was time for me to return to the boat and Jan’s home baked bread. In the afternoon I walked to Nantwich. We had run out of fruit so I had an order for oranges and bananas. I find the architecture in the town quite interesting. 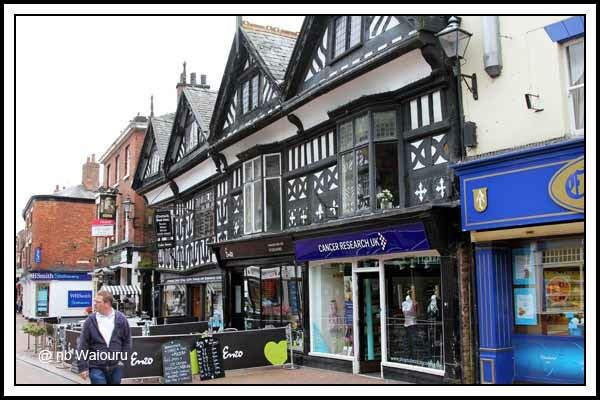 There are a number of Tudor style homes and from the plaques on them a number appear to be original. Obviously constructing building square and level wasn’t much of a priority when these building were erected. I assume the idea of a sawmill cutting straight edges didn’t exist and they simply worked with the shape of the timber they had at hand. Two ‘locals’ gave me two different descriptions of what this was. 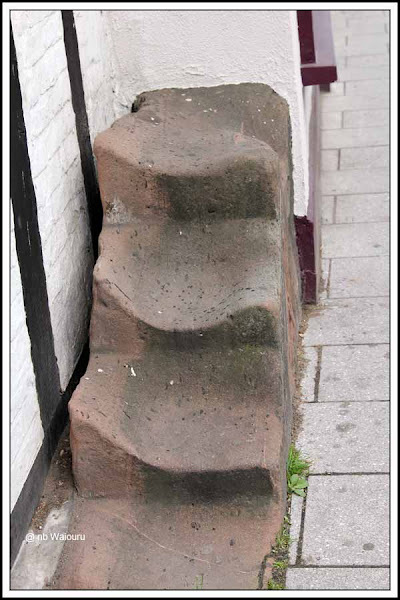 One told me it was an old set of steps for mounting a horse and the other informed me they were the worn remains of a sharpening stone used by a knife and scissor tradesman. I’ll leave you to make up your mind which you think is more plausible. 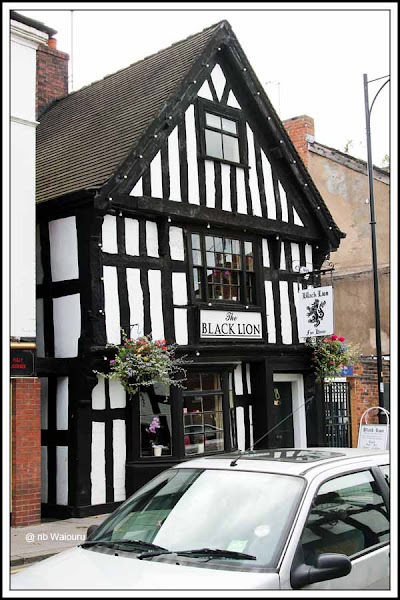 There is a plaque on these buildings stating they were rebuilt in the 16th century after the “Great Fire”. Hi Tom and Jan, I was out walking the dog......the hairy arm was Eric's doing the washing up! We're sorry we missed you both. Perhaps next time you're passing as we are likely to be here until at least the end of October. It is definitely a mounting block Tom.